What does the City do for bed bugs? Citizens residing in multi-unit dwellings (apartment buildings, hotels, duplex rental units) should first notify property management if a bed bug infestation is suspected. Most property managers are eager to exterminate an infestation quickly to prevent spread. In the event that no action is taken by property management, please call 311 to file a complaint. Please provide as much information as possible to facilitate rapid resolution of the problem. The city will work with property management to ensure that the infestation is eradicated. What qualifies as a bed bug infestation? 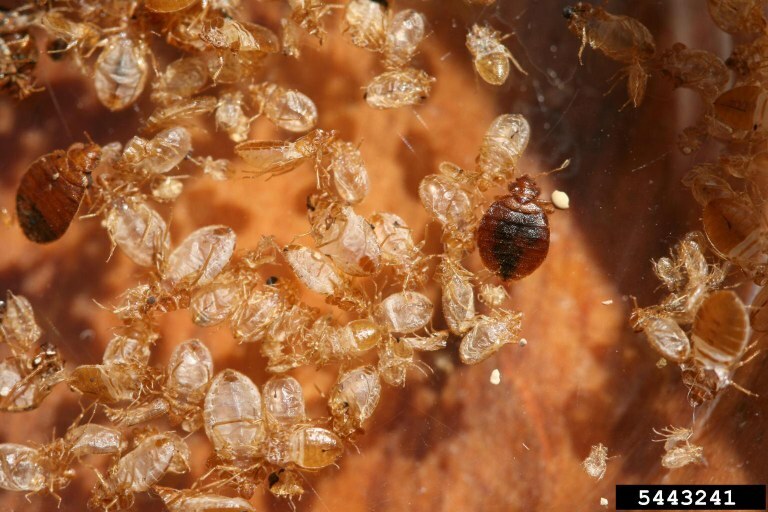 Unlike some other insect species, a single live bed bug can be cause for treatment of a unit. Rather than control; elimination of the population is the goal of bed bug treatment. What do I do if I find bed bugs in a hotel, motel or apartment that is in the City of Albuquerque? What do I do if I live in a single family home in the City of Albuquerque and find bed bugs? Ask if they have a bed bug management plan or any recommendations. I’ve told my landlord about the bed bug problem and they came and sprayed, but I’m still having a problem. What do I do now? My place has been sprayed but I’m still experiencing the welts. Does this mean they are back? Bites that went away and now are back can be a sign that the bed bugs are still there. However, there is some information suggesting that lesions can re-appear long after someone has been bitten and that a person can be sensitive to dead bugs. Getting rid of bed bugs after they have invaded a home takes time and lots of cleaning to penetrate all of their hiding places. Never rely on just spraying to take care of the problem and never assume a bite is from bed bugs unless the bugs have been identified. I couldn’t find any bed bugs, but I think I have them. Can pesticides be used just in case? Seal or repair peeling wallpaper, cracks in the floor boards and openings around pipes, wires or other utilities coming into your home. I don’t live in Albuquerque City Limits, but I found bed bugs in my home. What should I do? Contact your property manager and request assistance. Contact a private pest control company to treat your home. Follow the pre-treatment checklist in the meantime. Research your local government for a code enforcement or environmental health department. Do bed bugs spread disease to humans? Bed bugs have never been known to transmit disease. Bed bugs have tested positive for disease, however studies have shown they do not transmit disease. Can you tell a bed bug bite from other insect bites? No, bed bug bites look like bites of other blood-feeding insects, such as mosquitoes, fleas, biting gnats, or mites. How did I get bed bugs in my home? Bed bugs are great hitchhikers so it may be impossible to track down where they came from. Bed bugs have been found in homes, apartments, hotels, motels, health care facilities, dormitories, shelters, and schools. They have even been found in movie theaters, laundries/dry cleaners, furniture rental outlets, office buildings and different modes of transportation. Have you traveled lately? Did you experience unexplained bites during or shortly after your travels? 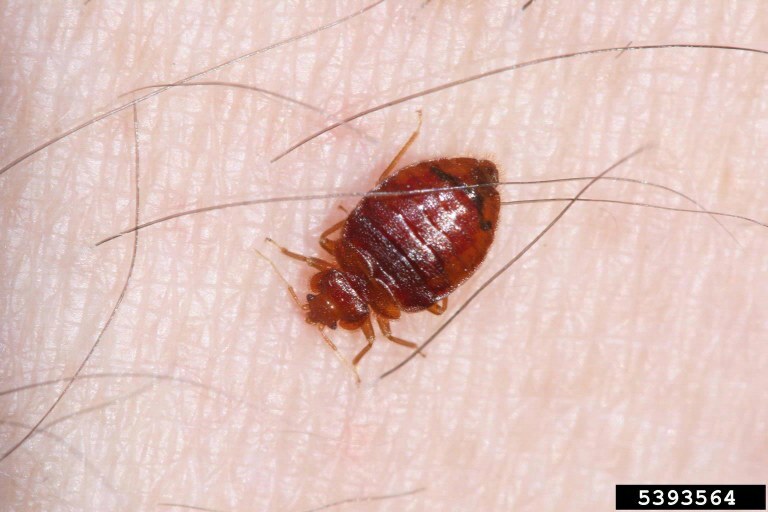 Bed bugs may have hitched a ride on your luggage or other personal items. Have you recently gotten a new to you piece of furniture? Did you inspect it prior to moving it into your home? Check that piece of furniture, if it seems like it has more signs of bed bugs then the rest of your furnishings; that may indicate it was the source. Haven’t traveled or acquired any furniture recently? In multi-unit housing such as apartment complexes and hotels/motels untreated infestations can spread to neighboring units through wall voids and electrical conduits. Report the infestation to management and request that they also have the adjoining units inspected. What to bed bugs look like? 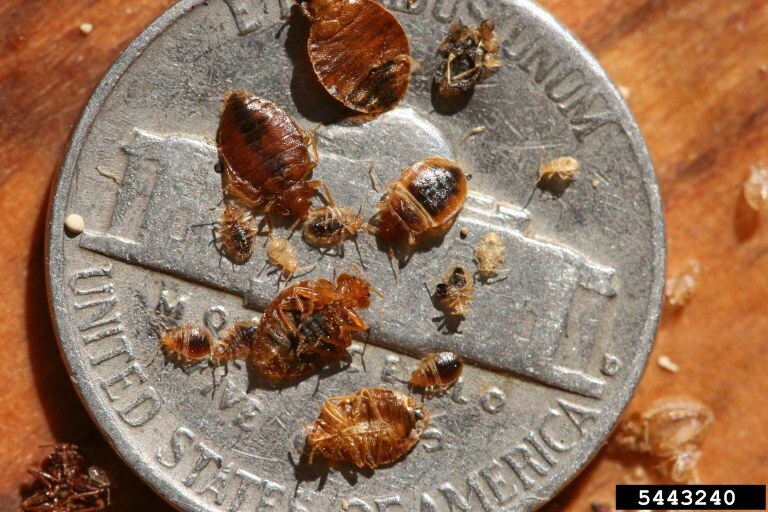 Adult bed bugs are straw-colored to reddish-brown, oval bodies, wingless insects about the size of a pencil eraser. Their eggs are white, slightly pear-shaped and about as long as a pinhead. Eggs are found in crevices in clusters of 10-50. Newly hatched bed bugs are nearly colorless but otherwise resemble the adults, only smaller. Bed bugs like to hide in the seams and tufts of mattresses, luggage, backpacks and other cloth items. They can also hide in cracks in the bed frame, gaps behind baseboards, pictures and other small areas. They do NOT live on people like lice, ticks or mites.